Next weekend, the Kaanapali Beach Hotel on Maui will present the 3rd annual Henry Kaleialoha Allen Hawaiian Steel Guitar Festival. 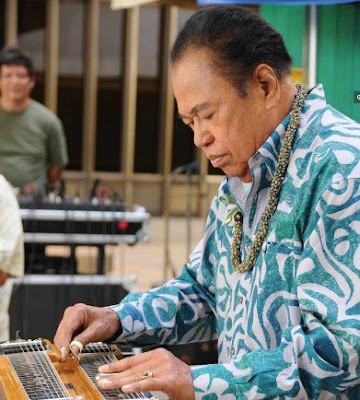 This festival features free concerts, presentations and hands-on workshops to celebrate the tradition of Hawaiian steel guitar music. Henry Kaleialoha Allen was one of the original steel guitarists for a Hawaii radio show, “Hawaii Calls,” and has been playing music for over 60 years. He actively promotes the Hawaiian steel guitar on the islands. You may be familiar with his excellent instruction book, "How to Play the Hawaiian Steel Guitar". Most of the festival events are free of charge. One exception is the Meet The Artist Reception Party — an exclusive opportunity to meet and talk with Mr. Allen on Thursday, April 28, from 6 to 9 p.m. Hosted by Maui Mayor Alan Arakawa and First Lady Ann Arakawa, the reception's $150 per person price includes food, wine, champagne, beer, individual photo sessions and gift bags. For reservations, call (808)669-6189. The free festivities start Friday morning April 29 and continue until 1 PM Sunday afternoon May 1. There are many musical performances, workshops and presentations. For a complete schedule of events, visit www.aecg.org.